The defending champions sealed their table-topping finish with four rounds still to play, building a 12-7 interval lead against the South Africans. 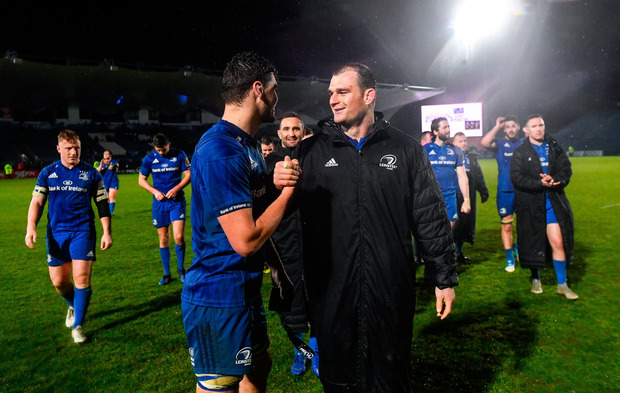 Conor O'Brien and the prolific Sibahle Maxwane exchanged tries during Ox Nche's sin-bin period inside the opening quarter before Adam Byrne marked his 50th Leinster cap with a well-taken effort in the corner. Rory O'Loughlin's smartly-finished 55th-minute try capped the scoring, giving Leinster their 15th victory from 17 rounds to open up a 26-point cushion over second-placed Benetton Rugby. An early kicking battle was broken up by prop Nche's ninth-minute sin-binning for catching Fergus McFadden with a late shoulder charge. Leo Cullen's men immediately took advantage, mauling up close before centre O'Brien powered over to the left of the posts for Ross Byrne to convert. Maxwane's searing pace, however, turned a hack downfield by Benhard Janse van Rensburg into the flying winger's 13th try of the PRO14 season, with Tian Schoeman's conversion drawing the visitors level. Leinster then regained the lead early in the second quarter as winger Byrne, fed by O'Loughlin's long pass, stepped inside Maxwane's tackle and touched down under pressure from Louis Fouche. The remainder of the first half proved to be rather listless, with the Cheetahs maintaining their tactical kicking, while Leinster were unable to get back into scoring range, despite promising runs from man-of-the-match Max Deegan and captain Rhys Ruddock near halfway. Ireland prop Andrew Porter conceded two penalties following his 43rd-minute introduction but a lineout infringement, in particular, went unpunished, with Schoeman pushing his kick wide from the right. Leinster eventually managed to get the scoreboard moving again approaching the hour mark. The Cheetahs initially defended a maul threat but O'Loughlin chipped over the top, dinked the ball on and won the race to the touchdown. Fly-half Byrne added a well-struck conversion from the left. Leinster ended the game hunting for a bonus point score through their forwards but the Cheetahs held them at bay.